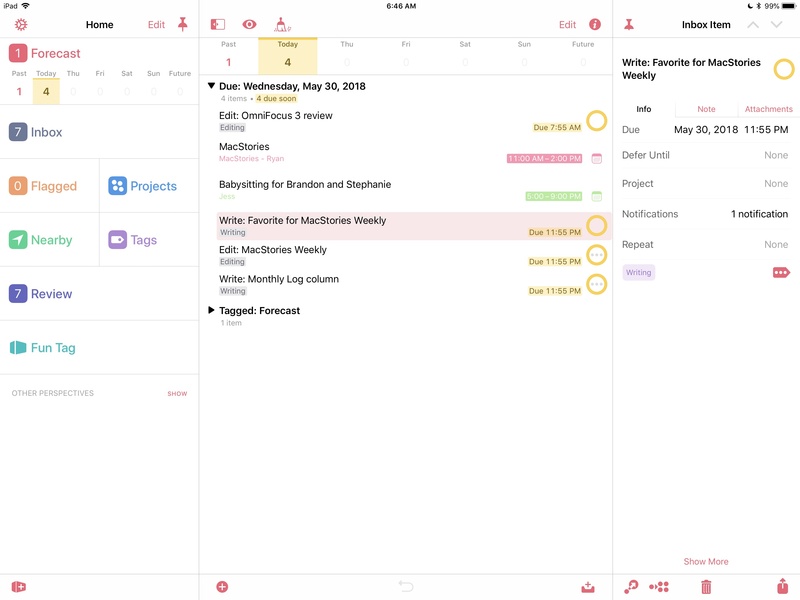 Recently customers have been wanting to take advantage of automation apps like Workflow, Drafts, Pythonista, and others to quickly add new actions or projects or switch to different views inside OmniFocus. With 2.14, OmniFocus now includes best-of-class support for callback URLs. At its simplest, this means that you can create a workflow that adds more than one item to OmniFocus. But we didn’t just add support for two-way communication between OmniFocus and other apps, we added support for automating a whole lot more of the powerful capabilities of OmniFocus. Ken goes into the nitty gritty in a detailed Discourse post. But aside from doing the usual name and note additions, you can add estimates, attachments, dates, repetition rules, flags, and even set a project to Parallel. While I won't be switching away from 2Do, I've tried the beta of OmniFocus 2.14 and the new automation features on iOS are impressive. I think a lot of people are going to reconsider OmniFocus and take advantage of callbacks for app integrations. The examples posted by Ken Case on the forums should give you an idea of the improved capabilities. It's no surprise that The Omni Group continues to redefine what making pro apps on iOS means. It's also great to see TaskPaper being used as a structured text communication format – I'd like to see more developers follow this route. 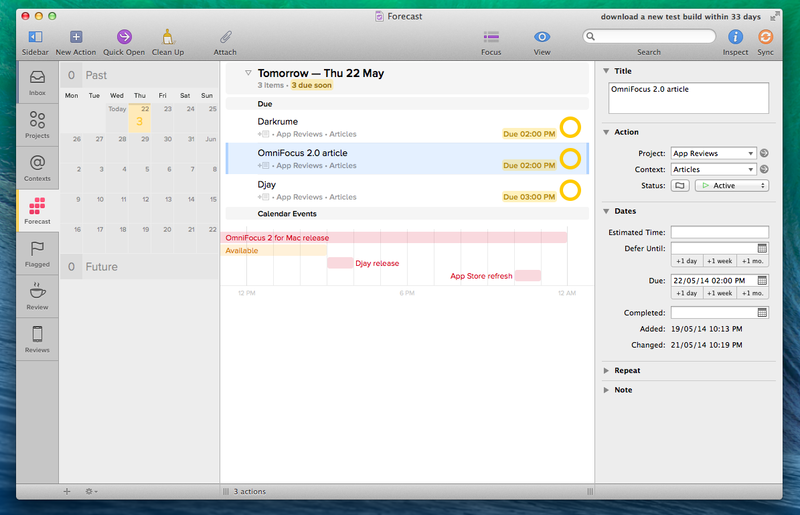 Today the Omni Group released the third and final installment of OmniFocus – OmniFocus 2 for iPad. 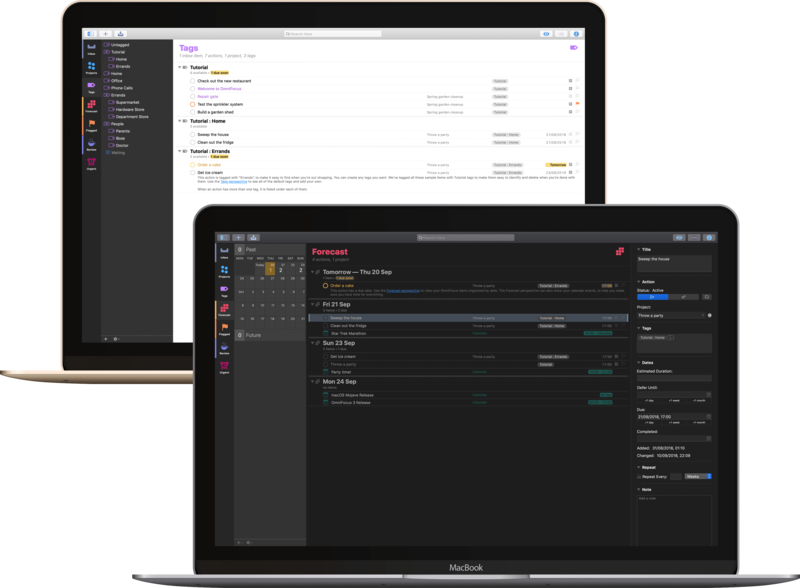 I call it an installment because although OmniFocus is a standalone product for both Mac and iOS, it truly excels when used as a cross-platform task management solution. 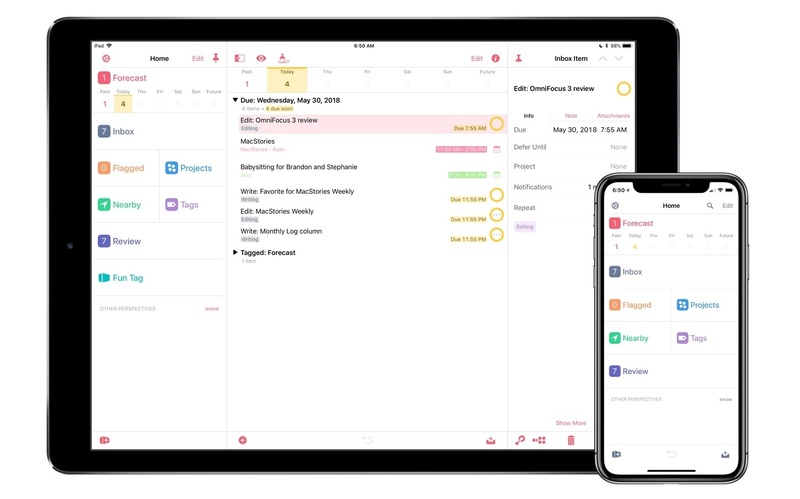 Current OmniFocus users like myself have been paitently waiting to replace our overly textured iOS 6-reminiscent iPad versions with something more suitable for the ecosystem of iOS 7 and beyond. 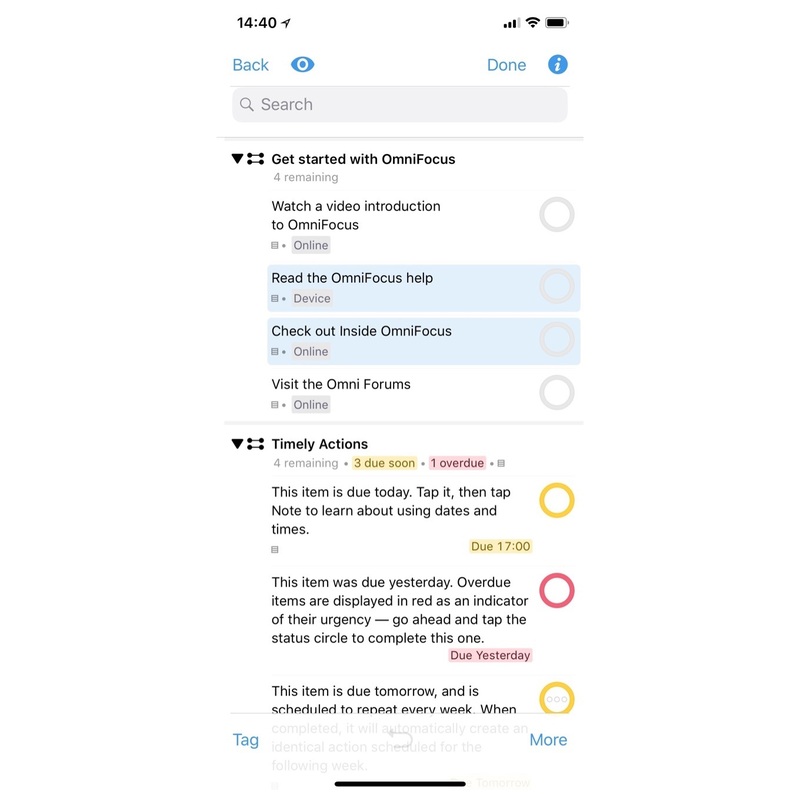 If you're looking for an in-depth review of the just-released OmniFocus 2, Shawn Blanc did a great job at explaining what OmniFocus does and documenting its evolution through the years. I don't need OmniFocus, but just reading Shawn's review makes me wish I had more projects to love the app as much as he does. There was a time when I thought that I needed a powerful GTD app to be productive. Over the years, I've come to realize that all I need, really, is just a list of things to remember and some calendar events. I've been using Apple's Reminders and Calendar with iCloud as my primary todo systems for over a year now, and my schedule hasn't been disrupted by a cataclysm of missed appointments and overflowing todo lists. It's with this mindset that I approached OmniFocus 2 for Mac, released today as a new version of The Omni Group's popular GTD software: fundamentally, I don't need the app. But as an old OmniFocus user who switched over to Apple's less flexible Reminders and stayed with it in spite of its (sometimes disarming) simplicity, I thought it'd be interesting to evaluate OmniFocus 2 with a fresh pair of eyes and a genuine curiosity for the work put into this new version.